The Rug Doctor Portable Spot Cleaner is a small and light weight machine that makes daily cleaning tasks easier. 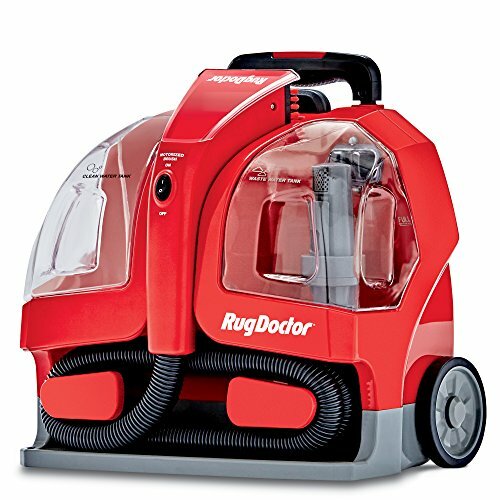 If you need a cleaner that can be easily carried around the house, especially stairs (it comes with a stair attachment), consider this machine. It uses well-engineered parts and advanced technology to clean the pet stains, accidental spills, and other types of tough stains efficiently. The spot cleaner can also be used to clean car upholstery, rugs, and spots and stains on carpets. With all these features, this machine is available at an affordable price and can start performing straight out of the box because of the easy assembly. Mostly carpet cleaning machines are big and heavy, and that makes it hard for the user to carry them around the house, especially through the stairs. The Rug Doctor Spot Cleaner has small dimensions and is very portable. It has retractable handle and wheels that allow users to pull and move it throughout the house to clean the dirt and debris. The presence of wheels makes it easier to drag the cleaner on the stairs and through slopes. When compared to bigger and heavier carpet cleaners of this category, the Rug Doctor scores better by far. Beside the retractable handle and wheels, the machine is light and can be stored easily at any place in the house. The appliance is equipped with a long cord of 15ft length, which allows the user to reach different places of the house after plugging it in. The user can easily clean a big hall or room in one go without having to unplug the appliance frequently. The lengthy cord makes it easier to reach all the corners of the room to clean the toughest stains, and there is therefore nothing to worry about if there are not many sockets around. Another excellent feature is that the brush also has an extensive reach, and it covers an almost four and a half inches wide area so that you can clean a lot in one swipe. The enthusiastic American in the following video LOVES it! Power cord length: 15 ft.
Motorized brush just vibrates and doesn’t do any heavy lifting. Rug Doctor soaps are costly. The Rug Doctor Portable Spot Cleaner is the favorite of many people around the world, and therefore it has a lot of positive customer reviews. For me here in Britain, it is a life saver, as I have three children and a dog. There are lots of accidental spills happening in our house, and this machine has worked perfectly to clean the spots and spills. The Rug Doctor Portable Spot Cleaner is one of the best performing and light weight cleaners available on the market. It's not very loud, and there is no need to use ear plugs during cleaning. It has a long cord and hose which allows the users to reach all the places that are difficult to reach. It has a powerful motor, and the motorized brush penetrates into the carpet to remove the dirt and grime stuck inside the fibers of the carpet. Overall, it's an excellent spot cleaner that is also available at an affordable price.